The James Russell Soley estate designed by Grosvenor Atterbury c. 1903 in the Shinnecock Hills in Southampton. Soley, an attorney, was an author and professor of history at the United States Naval Academy and served as the Assistant Secretary of the Navy from 1890-1893. He was later a partner in the firm of Tracy, Boardman & Soley. Soley and family were forced from the house in the middle of the night in August 1910 when a large fire broke out and quickly consumed the entire house. 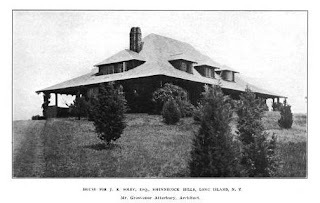 Photo from The American Architect, 1908.
excerpt "Although owner Gary Melius said Tuesday that business at Oheka Castle has been "steady," he wasn't able to refinance the property's $27.9 million mortgage when it came due Aug. 9. Mr. Melius said he remains in talks with the special servicer overseeing the loan to push back the due date by several years."